We left Puerto Varas, Chile early one morning to begin our full day journey through the Andes mountains to get over to the Argentinian side. I was hoping to stay in Puerto Varas for a couple more days to really enjoy this beautiful village. I guess this means I’ll have to come back! There was still so much more to see and do but all I kept repeating in my head was “three boats and four buses”! That was our mantra leading to this day. 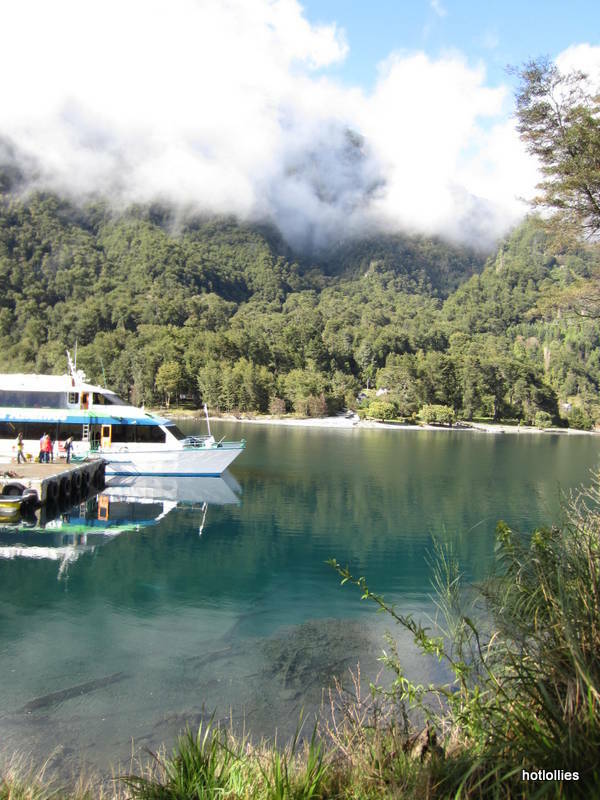 It was going to take us three catamaran boats and four tour buses to get to Bariloche, the chocolate haven and ski town in Argentina, and all in one day! 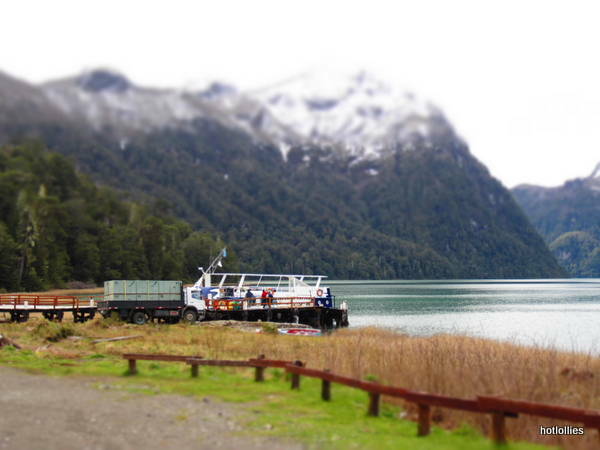 We took a tour bus to the Lago Todos Los Santos to board our first catamaran. 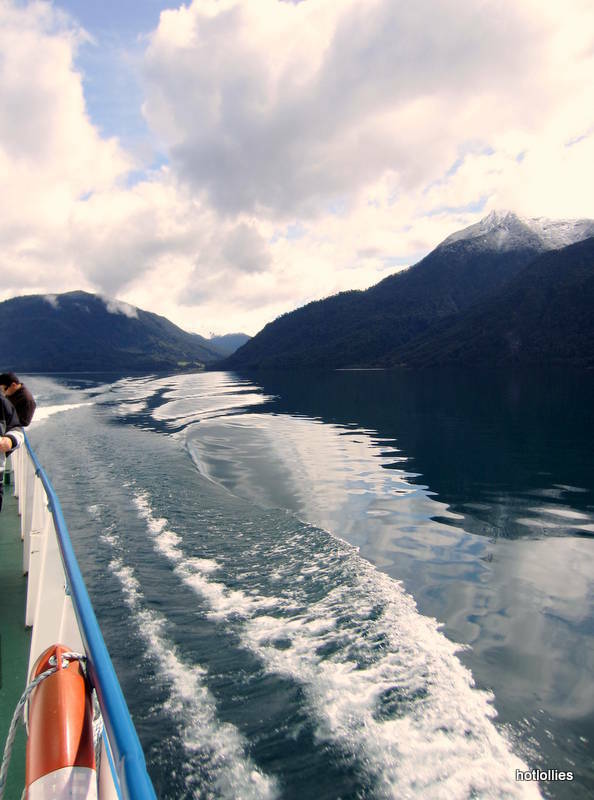 It was a nice leisurely two hour trip through the massive lakes filled with the melting snow and glaciers of the Patagonia. 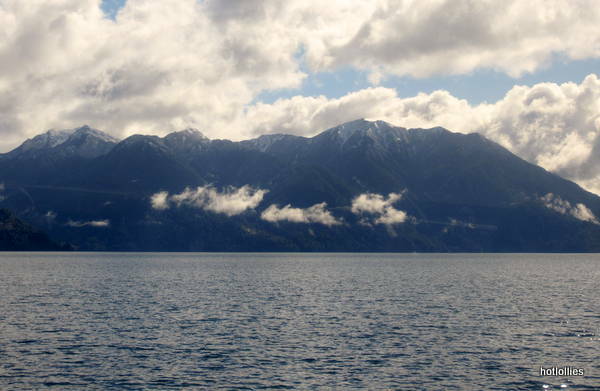 These areas are very popular for fishing salmon and trout, fly fishing, boating and hiking. Its a place you visit to relax and take in the sights. When we departed I caught this photo of a man teaching, I’m guessing, his 4 or 5 year old son how to steer the boat! Hey, you have to start training them young. The gorgeous views made me forget how much further we needed to travel. Beautiful clear day out for boating, we couldn’t have asked for better weather! The Chileans, similar to Europe and Caribbean cultures, have their biggest meal of the day during lunch time. It’s quite an adjustment when you’re used to having sandwiches, soups or salads for lunch but we didn’t protest and dove right in. Besides, we were in the middle of nowhere, between mountains and in the wilderness so any other food options we’d have to catch it ourselves! If you take this tour route its more than likely that you’ll stop at this hotel’s restaurant and if you do, you’ll be pleased with mostly anything on the menu. 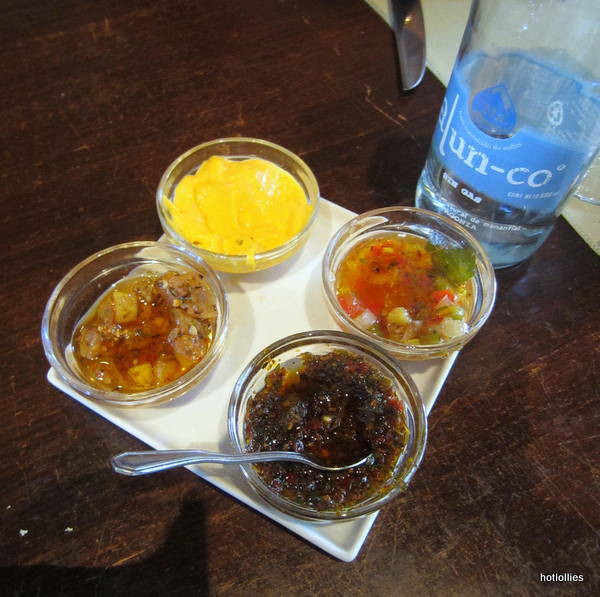 I didn’t see any spicy dishes on the menu so opted for the salmon and got a side of spicy salsa. 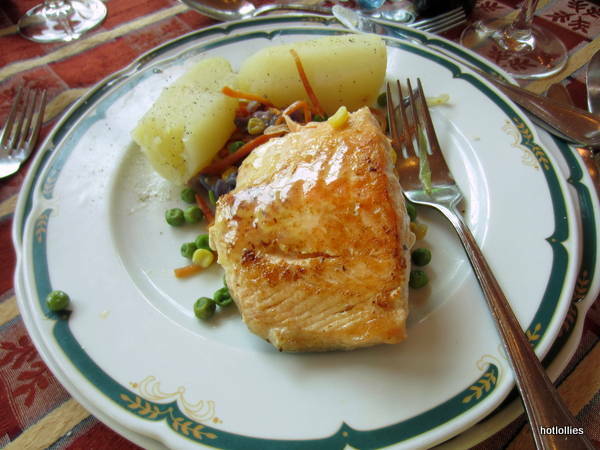 The salmon was perfectly cooked and the cut was very generous. My sister ordered the fried Merluza. 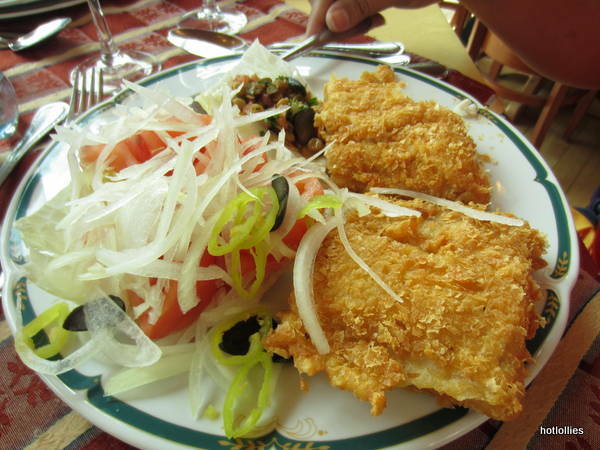 This fried fish was crispy and so tender and flaky that if it wasn’t for the crust you’d never know it was fried. Just perfection and super spicy too! I felt bad for my sister, she actually yelled out as soon as she bit into one, so of course I had to come to the rescue and handle those for her! Note to management, you probably want to warn folks about the blazing hot rings of fire on the plate! 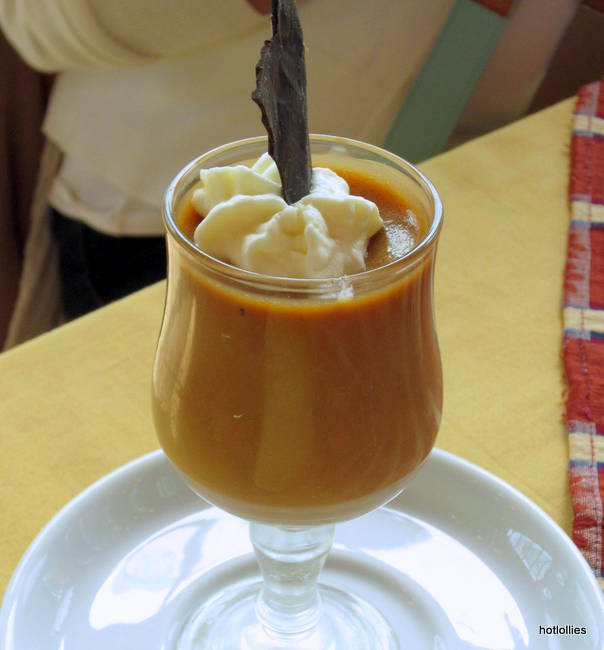 Delicious a dulce de leche custard. With bellies full we boarded the tour bus and headed towards the Tronador mountain to begin the second leg of our trip. 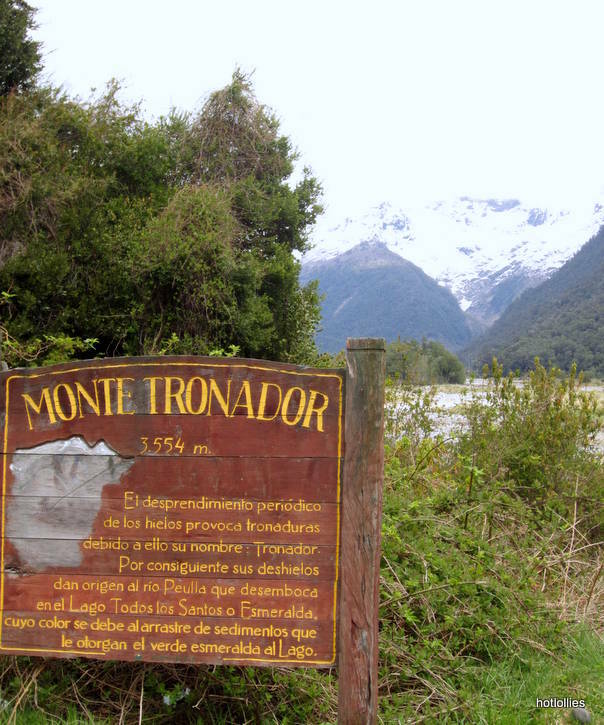 This mountain was given the name Tronador because of the thunderous sounds the glaciers make when they’re breaking off…an unfortunate result of global warming. 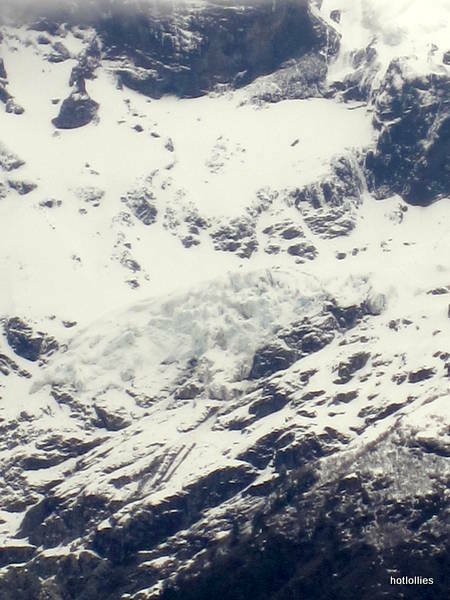 If you look to the upper right area of photo below you can see two of the glaciers. They actually look like black ice. 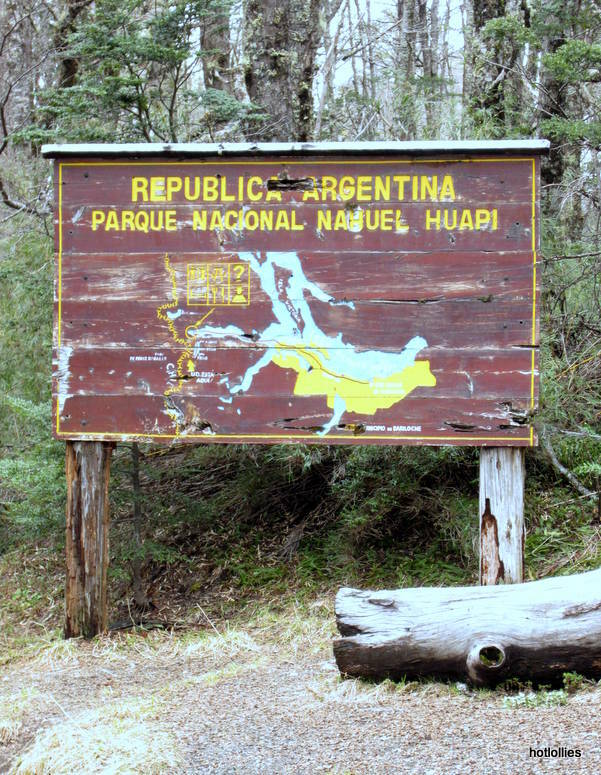 We traveled up the mountain and through the steep and winding roads of the Vicente Perez Rosales National Park which is in Chile to the border of Argentina where we entered the Nahuel Haupi National Park. After going through customs at the border crossing we boarded yet another catamaran at Puerto Frias. I was playing with the camera settings on this one and love how the boat looks like a little toy. The boat could probably fit about 50 people comfortably so there was plenty of room to move around. One thing that’s great about crossing the lakes with a tour company is that you don’t have to worry about lugging all your baggage. 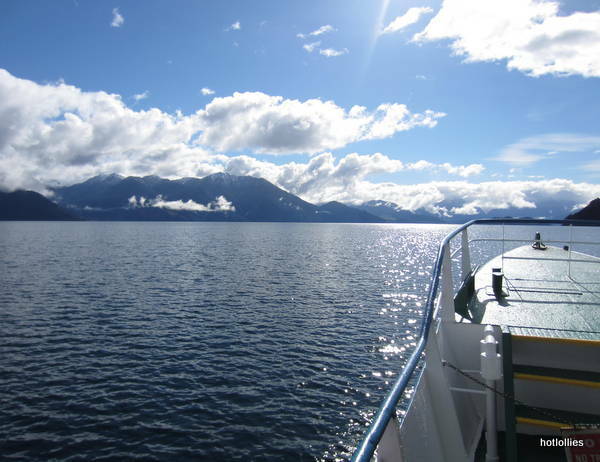 You can easily board the boats quickly and enjoy your trip stress and worry free. 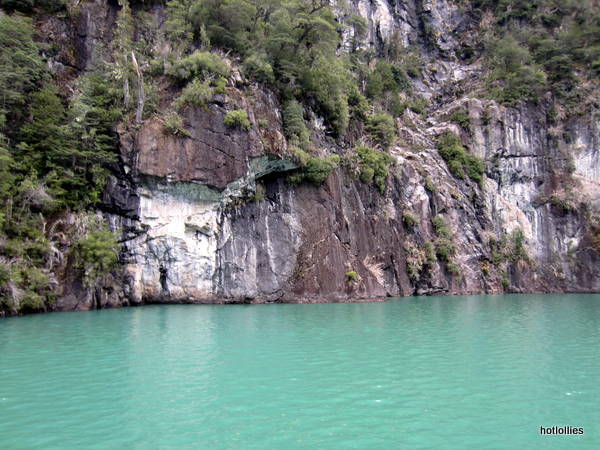 The water in lake Frias is so bright and green from the mineral deposits released when the glaciers crash down the mountain. It’s a beautiful site to see. It was so cold out I was only able to stay out for about five minutes at a time even though it was the beginning of Spring. I can just imagine how magnificent it would be to visit during the summer months. Yes, the water is this blue! The locals call it Emerald Lake because of the color but it looked more like turquoise to me. 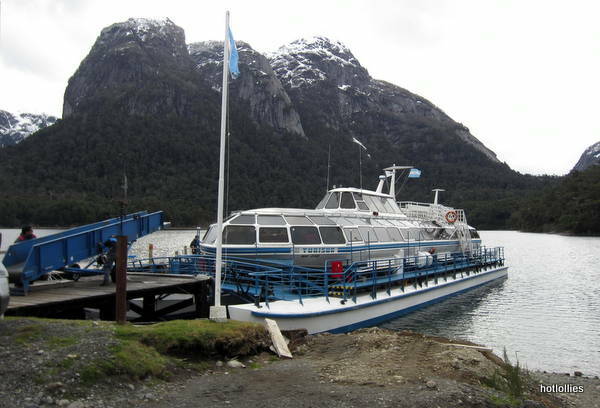 We boarded the third catamaran at Puerto Blest for the last leg of our tour before reaching Puerto Panuelos, then it was a quick bus ride to Bariloche. 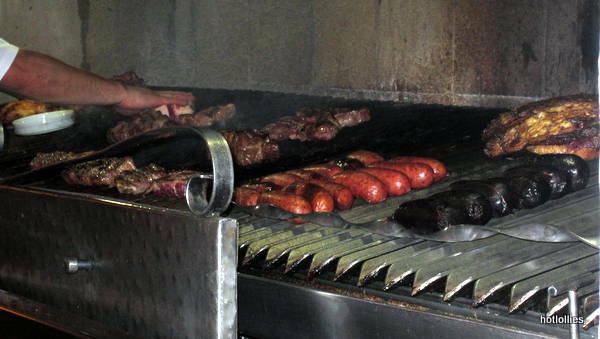 We finally make it to our destination for the next few days and immediately zeroed in on a parillada, a grill house, for a taste of what the locals eat. Actually, a parillada is a platter of grilled meats and most include various cuts of beef, chicken and pork, with some offal as well. 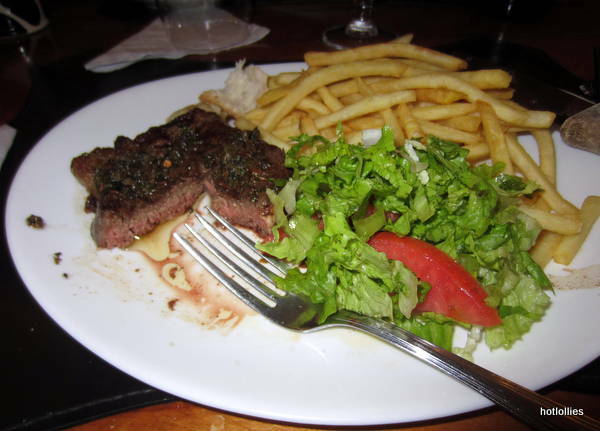 I settled for a tender steak, my first in Argentina and it’s as delicious as rumored. 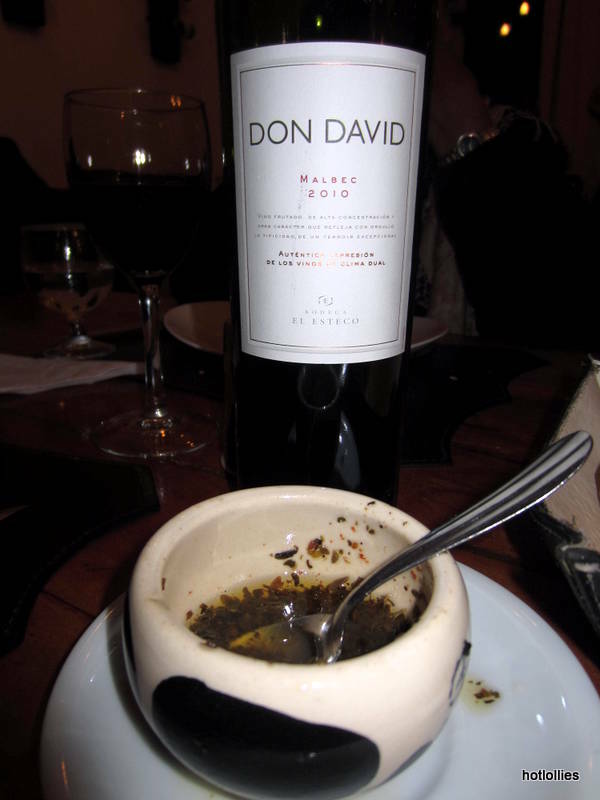 Try Alberto’s in Bariloche for great food and great wine, this bottle of Don David Malbec was a very good medium bodied wine and complimented the steak very well. 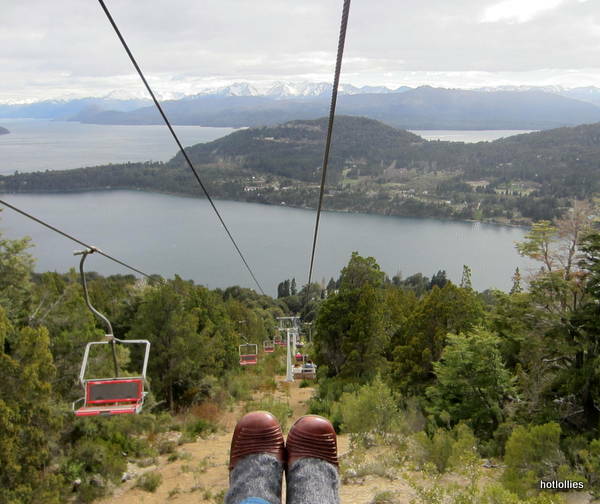 The next day we took ski lifts up to the top of Cerro Campanario for a spectacular view of Bariloche and surrounding towns. It was so cold up there so I enjoyed the view from inside with delicious hot chocolate. We headed back to town and stopped at Don Molina’s for lunch, another great place spot for amazing food. 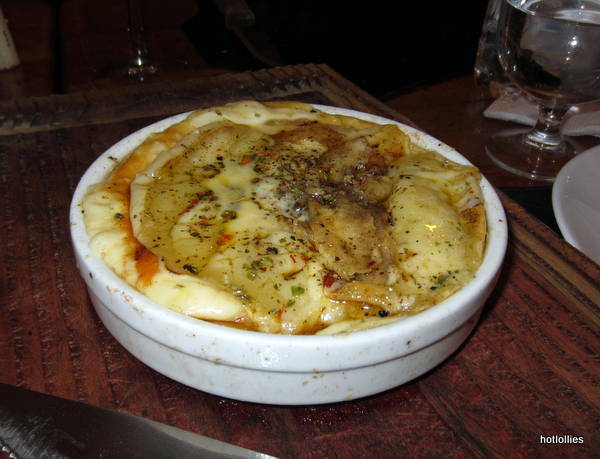 Argentina isn’t just known for it’s wonderful steak, you can find exceptional Italian, French, German and Swiss food as well. 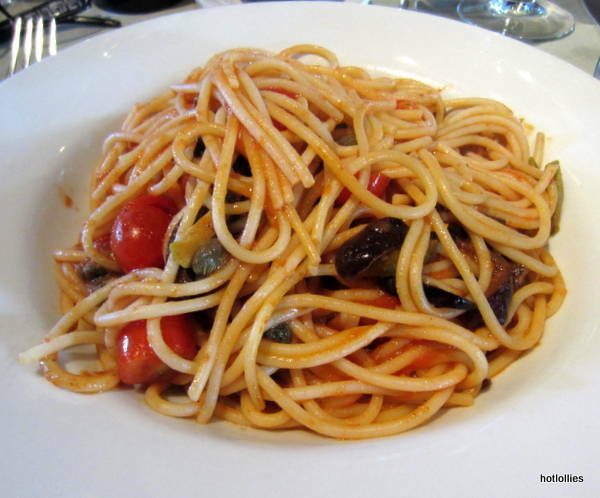 Pasta puttanesca, spicy and al dente! 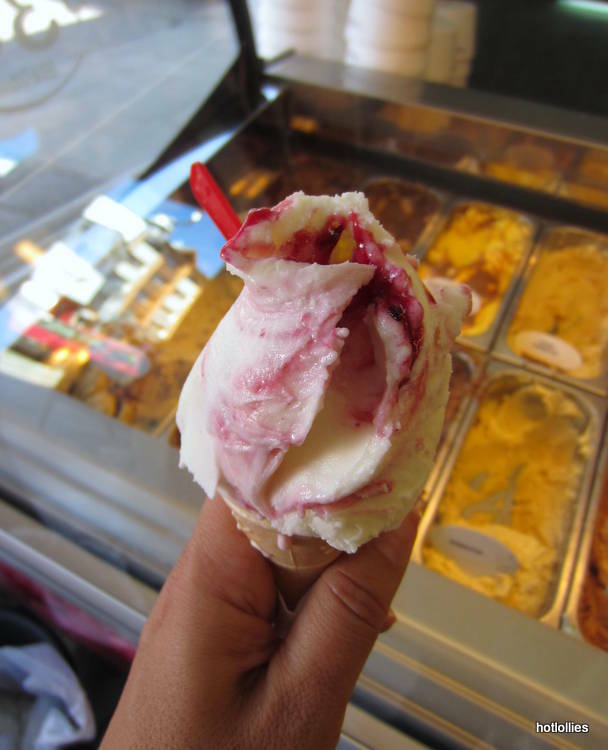 You’ll find several gelato shops, bakeries, chocolate shops a few blocks from Don Molina if you want to take a walk before getting dessert. 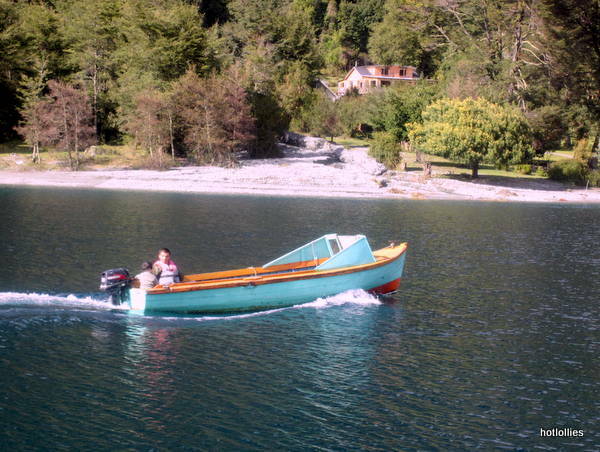 These were on the way back to our hotel, the Nahuel Huapi, so the walk was quite nice after such a huge meal. By the way, the cake below is signed “Happy Birthday Fatty”! A term of endearment I’m sure! Well hola Russia! 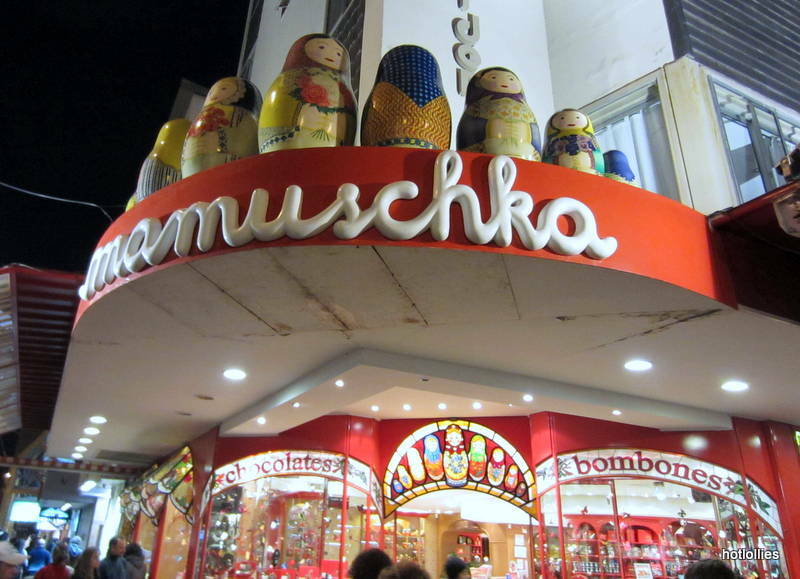 Mamuschka is a very popular chocolate shop in the heart of Bariloche. Seems like every third door on this street will have a chocolatier. Walk into any of them and the staff will be more than happy to give you free samples. 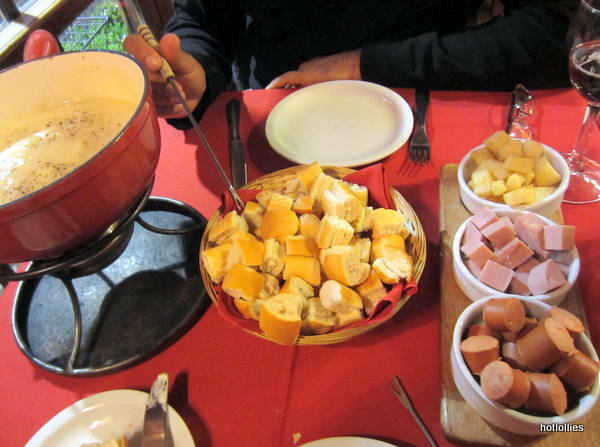 Before we left Bariloche I had to try the fondue at Marmite, a little pricy for fondue but I was craving it! 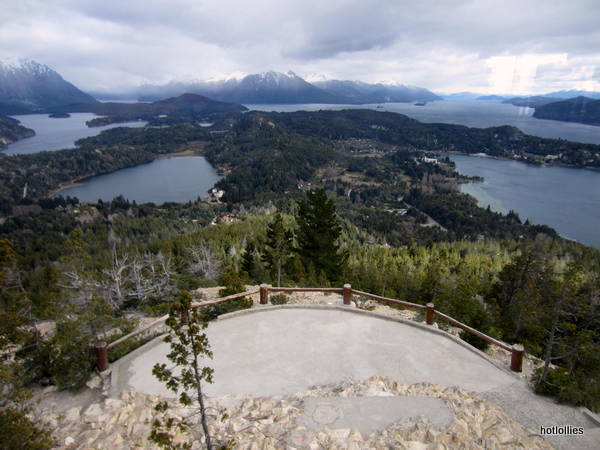 Bariloche is one of those towns that you can spend several days exploring. 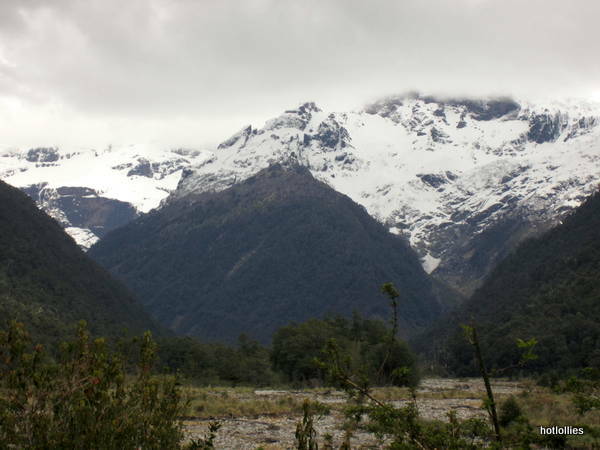 It’s known as the central hub for the Patagonia area with the nearest airport about 40 minutes away. It’s Springtime now and there are plenty of adventures to be had and amazing food as well. Next time I’ll come during the summer months and try wind surfing or kayaking and rock climbing. If you’re here during the winter months, expect lots of snow, I hear the mountains can easily get up to 2 meters of snow, so bring your ski gear! 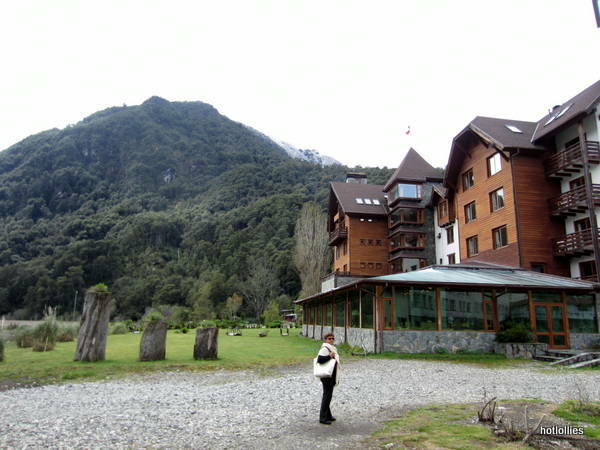 Loved reading about your trip to Bariloche! I stayed there for a couple of months a long time ago in summertime, and thought it was wonderful. Did you see the Bosque de Arrayanes (Disney’s inspiration for the forest in Bambi)? Thanks Anita! No I didn’t get to go there but did see a few of those Arrayan trees scattered around…their bright orange color is very striking. I’m already thinking of the things I’ll do when I return! 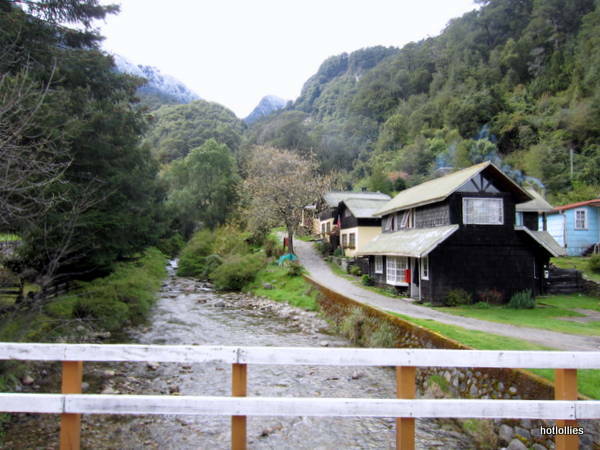 Bariloche is such an amazing and peaceful place! Lovely article about the lakes crossing, and great photos! 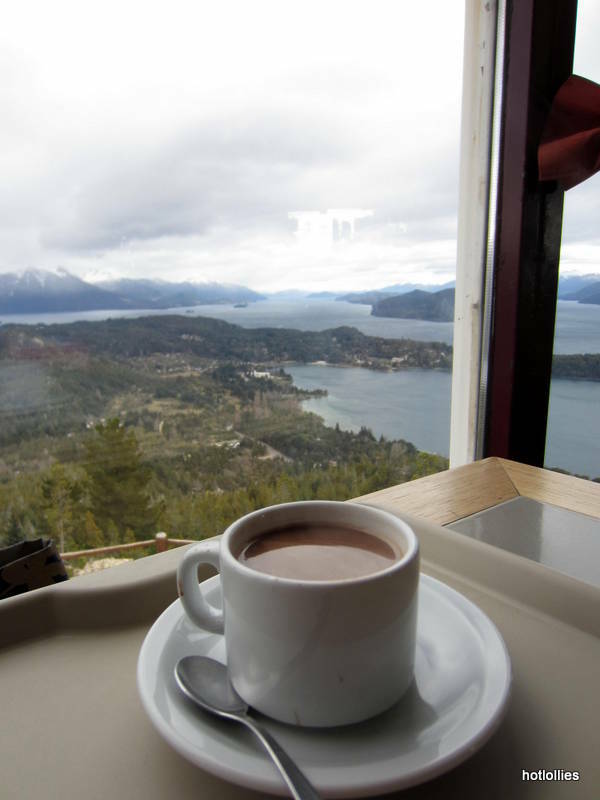 I love the shots from Campanario Hill and the chocolate shops in Bariloche. Thanks Kaitlin! The Patagonia is an amazing place. 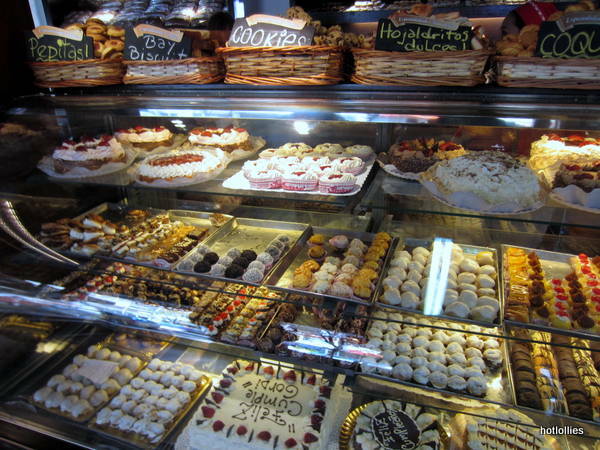 I probably had way too much chocolate…which isn’t difficult in Bariloche! thank you, really appreciate you visiting!